Rapper 50 Cent in Chicago for his Power by 50 fragrance launch. CHICAGO – Rapper 50 Cent greeted the HollywoodChicago.com lens on Nov. 9, 2009 before meeting and taking photos with hundreds of fans at the Chicago launch of his new fragrance “Power by 50” at Macy’s on State Street in downtown Chicago. 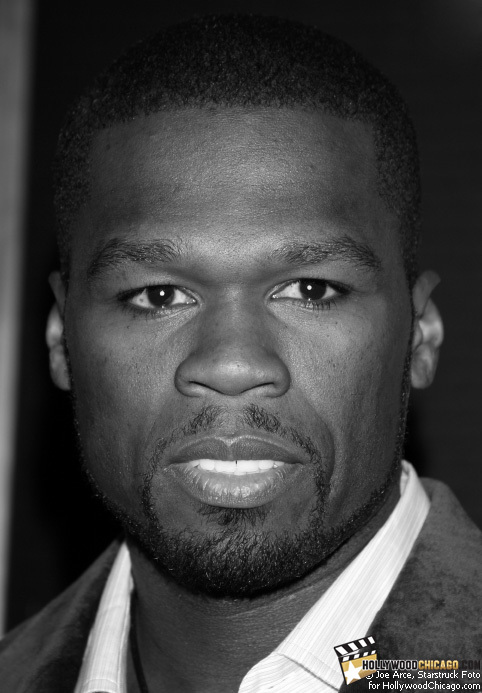 50 Cent has also appeared in the following films: “Get Rich or Die Tryin’,” “Home of the Brave,” “Righteous Kill,” “Streets of Blood and “Dead Man Running”. You can click “Next” and “Previous” to scan through this slideshow or jump directly to individual photos with the captioned links below. All photos are credited to Joe Arce  of Starstruck Foto  and HollywoodChicago.com. All rights reserved. 50cent1 : Rapper 50 Cent greets the HollywoodChicago.com lens on Nov. 9, 2009 before meeting and taking photos with hundreds of fans at the Chicago launch of his new fragrance “Power by 50” at Macy’s on State Street in downtown Chicago. 50cent2 : Rapper 50 Cent greets the HollywoodChicago.com lens on Nov. 9, 2009 before meeting and taking photos with hundreds of fans at the Chicago launch of his new fragrance “Power by 50” at Macy’s on State Street in downtown Chicago.